The origins of first part of the town's name is really uncertain as some historians say that Challand derives from the Latin word "kalanco" (channel for avalanches), others from the Valais dialect "Tsala" (grazing around the lodge), whilst for others it derives from "Kala" (secure location), or from "chafland" (land of sheep) or even, from the Latin "calere" (being hot), or from the Celtic "cal" (steep wall) or, finally, "chal" (hollow shaft) . 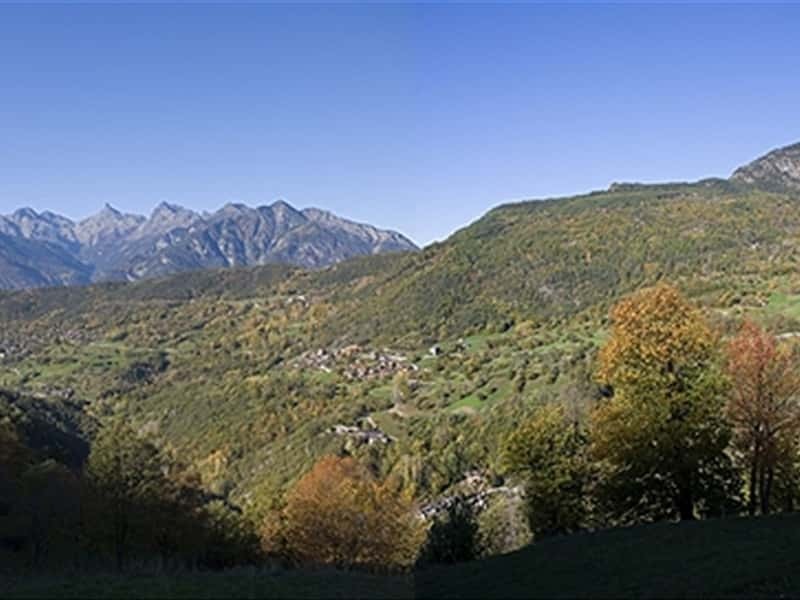 It is a town located between the Val d'Ayas and the Valley of Challand, bordered to the East by the Valley Dondeuil with its woods and its famous peaks: Punta Granlà, Monte dell'Aquila, Corno del Lago, Becca Torchè, Becca Mortens and Becca Chalex; and to the West from the Colle Darlaz, Mont de Saint Gilles and Mont Congo. In this area flows the Evançon. The small hidden villages preserve an architectural and historical heritage of great value and offer its visitors a series of charming views. The town, still today, presents its mining traditions and activities. The area was certainly inhabited since ancient times, as shown by the finds in the area: pre-Roman bracelets in Tilly, Roman coins in Corliod, traces of mining activities dating from the Copper Ages in the nearby town of Challand Saint Anselme, and the remains of a settlement dating to the early Iron Age in the village of Chatillonet. In 1206 Thomas I, Count of Savoy ceded the town to Bosone II, Viscount of Aosta, and Villa Challand became a castle that in 1263, was expanded by Ebalo Magno, founder, along with his brother, Aimone, of the Chaplaincy of St. Peter. Historical records show that in the XII-XIII centuries some villages were populated by settlers from Walser. After the war of succession between Catherine Challant and Peter Sarriod, the fief received from Jacques Challant a series of tax and property grants. In 1928 the municipality was merged with the one of Saint Anselme Challand with the name of Challant and then separated again in 1946. The Parish Church of San Vittore, consecrated in 1521 and enlarged in the XVII century, features a rectangular shaped plan. The façade dates from 1670 with a large wooden portal, surrounded by a stone lintel, and preceded by a portico with two columns. A lateral portal is of the XVI century and inside it preserves a series of XIX century paintings on the vaults depicted by Giovanni Stornone. The original bell tower collapsed in 1755 and was rebuilt in 1762. The Chapel of St. Massimo, not far from Chataigne, was frescoed by Giacomino of Ivrea. The Chapel of Our Lady of the Snows in Villa Challand dating back to 1663, was rebuilt in 1850, the exterior was decorated in 1872 by artist Sogno. The Castle of Villa, of which only ruins and moat remain, where once stood the drawbridge. It is located at 867 meters above sea level and overviews all the area below between the mountain peaks of the Vallon Dondeuil, the entire Verrès area and the local area of the Reserve of Lake of Villa. It was sold in 1200 by Thomas I Count of Savoy to Viscount Bosone II of Aosta, founder of Challant Family. The manor then passed to Godfrey and I Aimone III, then to Ebalo Magno who renovated and expanded the building, making it his residence. Mortgaged, it was rescued in 1370 by Boniface and Giovanni of Challant. The building, which originally consisted of a square tower, in 1300 was greatly expanded with the elongated perimeter walls and an enlarged courtyard. The walls were fortified in 1430 during the conflict between Catherine Challant and her sister Margaret. The Tower of Bonod, also known as Tour des Signaux, located next to the castle, was a sighting point and a customs of trade. La Reserve Naturelle Lac de Villa, located a short distance from town, is an environment, of vital importance, for the conservation of the local flora and fauna. At the center of the Reserve, there is a small lake of glacial origins. This town web page has been visited 15,225 times.